Deja Wilson was given a second chance. She’ll always be grateful to Sophie for her kindness. Now, they’re best friends. The McCords, including Emmett, only like her for Sophie’s sake. It doesn’t stop her from wishing things were different, that she could have a good man like Emmett. When her brother is released from prison and arrested again the same day, she knows Emmett will never want a woman like her. Especially when he learns the truth about why her brother was sent to prison. It doesn’t matter anyway. She doesn’t deserve him. Emmett McCord has wanted Deja since the moment he met her, despite how she came into their lives. It didn’t take long for him, and the family, to forgive her and see just what kind of woman she is. Strong. Determined. Remorseful. Faithful to a fault. He wants to declare his feelings, but he knows she’ll resist him. He can’t risk losing her friendship. When her brother walks back into her life, causing her pain, he’s done keeping his feelings to himself. He wants her, and she’ll just have to get used to it. Since the evening Emmett met Deja, he was smitten. He even gave her a job, friendship and made her feel almost good enough for him, because she knows he wants her for more than an employee. She also knows she isn’t good enough for the likes of a good man like Emmett. Emmett will do anything to prove her wrong, but when she needed him most to support her, no matter what, they both seemed to fail each other as he stumbles and she makes it impossible for him to regain his footing. Sometimes all one needs is a second chance to find happiness and a place to belong, but accepting that she was deserving of the good things in life was almost impossible for Deja. Her past has been dark and tumultuous and at its very bleakest point, Deja was forced to stand on her own. Now a piece of her past is about to return after ten long years and she will do anything to rekindle the love and support that she and her brother once had and she doubts that anyone in her new life will accept the past she has kept hidden. 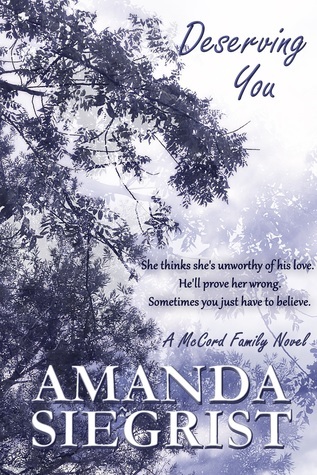 DESERVING YOU by Amanda Siegrist is filled with secrets, some not-so-secret and some that are kept like a wall of unnecessary protection. There is also love, between friends, family and that special romantic love, but the pain levels are off the charts! The distortions of perceptions are almost painful to read. Two people, clearly meant to be together must overcome the obstacles of the past, accept the reality of the present and take a chance on the future whiel opening their hearts to trust. Leave it to Amanda Siegrist to put her characters and her readers through the emotional wringer before giving us her signature happily ever after in her own time and in her own way! This time out, she provides more than one and she left me smiling! I am voluntarily reviewing an ARC edition.